One of the oldest and most remarkable landmarks in the City of London is the St Paul’s Cathedral, located on Ludgate Hill. The design of this amazing domed cathedral was signed by Christopher Wren and its construction was carried out from 1675 till 1710. St Paul’s replaced an old Gothic medieval cathedral that was torn down during the Great Fire of London, in 1666. St Paul’s Cathedral is one of the most important buildings for the British history, as it has seen the funerals of Churchill, Wellington, Nelson and many other British military leaders. At the same time, at the end of the World War I and World War II, it has held significant peace services. One of the most famous and impressive features inside the cathedral is the Whispering Wall, so make sure you don’t miss it. Moreover, St Paul’s Cathedral is one of the few places in London that offers breath – taking panoramas over the British capital. Another place that you can visit inside the cathedral is the crypt that holds the world – renowned tombs of Christopher Wren, Wellington and Nelson. If you travel on a budget, you must know that you can visit the attraction for free if you go there during the midday service. However, if you do want to see all its features, including the top and the views it offers, you have to buy a valid ticket. The family ticket is 21.50 GBP, the child ticket is 3.50 GBP (for children between 7 and 16 years old) and the concession ticket is 8 or 9 GBP. 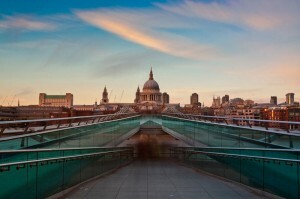 In order to get to St Paul’s Cathedral, you should take the tube to St Paul’s. In order to get rail transport from London Luton Airport to City of London, you have to take the bus to Luton Airport Parkway and then the train to West Hampstead Underground. From here, you must use the Underground Service to Waterloo Underground Station. There are also other transfer options such as using a transfer service from London Luton Airport or West Hampstead to City of London. So as to travel by car from London Luton Airport to City of London, you must use the M1 motorway. London Luton Airport is 31.9 miles away from City of London. A journey by transfer from London Luton Airport to Central London with 247 Luton Airport Transfer is going to last almost 1 hour and 5 minutes. The price for a transfer service from London Luton Airport to City of London starts from 54 GBP for a saloon car.